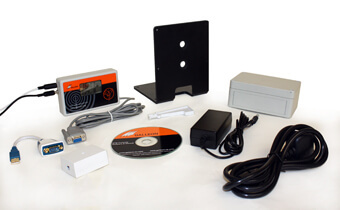 Server ARC with remote antenna (IP65) Consists of mains powered Atomic Radio Controlled Computer Clock with remote antenna up to 200m (600 ft) away. It has an integral Time display and signal strength indicator, serial interface (USB optional), LED signal display, power supply and converter. Synchronises to the WWVB time signal. AC-700-WWVB clock + power supply.